Abstract: A novel online antenna array calibration method is presented in this paper for estimating direction-of-arrival (DOA) in the case of uncorrelated and coherent signals with unknown gain-phase errors. Conventional calibration methods mainly consider incoherent signals for uniform linear arrays with gain-phase errors. The proposed method has better performance not only for uncorrelated signals but also for coherent signals. First, an on-grid sparse technique based on the covariance fitting criteria is reformulated aiming at gain-phase errors to obtain DOA and the corresponding source power, which is robust to coherent sources. Second, the gain-phase errors are estimated in the case of uncorrelated and coherent signals via introducing an exchange matrix as the pre-processing of a covariance matrix and then decomposing the eigenvalues of the covariance matrix. Those parameters estimate values converge to the real values by an alternate iteration process. The proposed method does not require the presence of calibration sources and previous calibration information unlike offline ways. Simulation results verify the effectiveness of the proposed method which outperforms the traditional approaches. Abstract: Though compact polarimetric approaches have been developed and applied in space and geo researching systems they have not been taken into consideration in automotive applications, yet. A sensor system has been designed to conduct polarimetric measurements in the 77 GHz frequency band, which is permitted for automotive usage. This system is able to transceive linearly as well as circularly polarized electromagnetic continuous waves. Depending on the case of application, the frequency output can be set statically or modulated over time within adjustable parameters. Hence, a variety of compact polarimetric modes can be performed and compared with full polarimetric approaches. Two compact polarimetric modes, dual-circular polarimetric mode, and circular-transmit-linear-receive, will be introduced and applied in this contribution. Their operability in this frequency range will be investigated after the microstrip antennas as well as the beam focusing dielectrical lense are characterized. Finally, results of a realistical measurement set-up will confirm the practicability of compact polarimetric approaches for double bounce recognition. Abstract: Accurately and efficiently modeling the drain-lag effects is crucial in nonlinear large-signal modeling for Gallium Nitride high electron mobility transistors. In this paper, a simplified yet accurate drain-lag model based on an industry standard large-signal model, i.e., the Chalmers (Angelov) model, extracted by means of pulsed S-parameter measurements, is presented. Instead of a complex nonlinear drain-lag description, only four constant parameters of the proposed drain-lag model need to be determined to accurately describe the large impacts of the drain-lag effects, e.g., drain-source current slump, typical kink observed in pulsed IV curves, and degradation of the output power. The extraction procedure of the parameters is based on pulsed S-parameter measurements, which allow to freeze traps and isolate the trapping effects from self-heating. It is also shown that the model can very accurately predict the load pull performance over a wide range of drain bias voltages. Finally, the large-signal network analyzer measurements at low frequency are used to further verify the proposed drain-lag model in the prediction of the output current in time domain under large-signal condition. Abstract: In this paper, design and development of a via-free composite right/left handed transmission line (CRLH TL)-based diplexer for WiMAX and WLAN bands is reported. The diplexer is having two channels, where each channel consists of a separate bandpass filter (BPF). The BPF of both channels are designed on via-free CRLH TLs based on a newly proposed right-angled corner-modified split ring resonator (RAC-MSRR) structure. The RAC-MSRR incorporates meander paths because of which working scope of frequencies is focused for measured center frequencies (f1) 3.5 GHz with −3 dB fractional bandwidth (FBW) of 21.21% (BPF1 channel) and (f2) 5.6 GHz with −3 dB FBW of 13.29% (BPF2 channel). For diplexer design, T-section is used for joining two BPFs which results in very good isolation of more than 32.5 dB over the frequency band of 2.5–8.0 GHz. The designed diplexer has passband insertion loss of −0.87 dB at f1 and −1.25 dB at f2. Overall size of the fabricated diplexer including 50 Ω feed line is 18 × 15 mm2. Equivalent lumped circuit model parameters of the diplexer are obtained from the pseudo-inverse matrix technique. Measured results show good concurrence with simulated results and subsequently approve the proposed model design. Abstract: This paper presents a novel balanced-to-balanced power divider (PD) based on a simple and compact three-line coupled structure for the first time. By bisecting the proposed symmetrical structure, the differential mode (DM) and the common mode (CM) equivalent circuits can be obtained for analysis. The DM equivalent circuit exhibits a three-line in-phase power dividing response, and then a resistor is added between the two outputs for achieving good isolation. Meanwhile, the CM equivalent circuit shows a three-line all-stop response so that the CM suppression in this design does not need to be considered. Accordingly, the detailed design procedure of the DM PD is given. For demonstration, a prototype centered at 1.95 GHz is designed, fabricated, and measured. The simulated and measured results with good agreement are presented, showing low DM loss and wideband CM suppression. Abstract: This paper specifies a concise review of recent research and development in the context of electromagnetic absorbers. An attempt has been made to justify the need for economical and thin microwave absorbers for achieving good absorption characteristics over a wide range of frequencies within a specified band of electromagnetic spectrum. This paper mainly focuses on the challenges encountered while designing a perfect electromagnetic absorber which can absorb electromagnetic radiations of any polarization that may appear from any direction and may occur over a broader bandwidth. The absorbers which are competent enough to withstand all these challenges are capable to suppress the reflection and transmission of unknown electromagnetic radiations efficiently to the lowest possible level. Several prospects of nanotechnology in flexible absorber design are also described to enhance absorber characteristics. This paper also provides a futuristic glimpse on several applications of such absorbers for commercial and military purposes. Abstract: A compact ultra-wideband (UWB) bandpass filter (BPF) based on surface-to-surface transition technology with features of extended stopband and integrated interference mitigation characteristics is proposed. The basic structure consists of a modified multiple-mode resonator (MMR)-based co-planar waveguide in the ground surface and coupled in broadside manner with the microstrip lines on the top surface. Later, two open-circuited stubs are embedded in the feeding lines and two complementary split ring resonators are etched in the MMR to implement multiple in-band transmission zeros so as to circumvent interference. A prototype is fabricated and measured to validate the results obtained in simulation. The proposed UWB-BPF is compact in size with overall dimensions of 17.82 by 11.08 mm2. Abstract: A shorted magneto electric dipole with orthogonal dual polarization is designed for modern wireless communications. The proposed antenna is a wideband dual-polarized antenna consisting of magneto electric dipoles, which are fed by novel hook-shaped strip feeds. 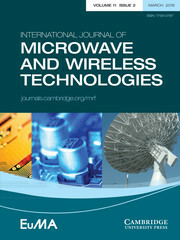 The antenna proposed in this paper is simulated using EM simulation software called high-frequency structure simulator. The simulated and measured results are presented. This antenna achieves 45.4% of impedance bandwidth of −10 dB RL for frequency range from 1.7 to 2.7 GHz. This frequency range covers the wireless communications applications like GSM 1800/1900, WCDMA, Bluetooth, Wi-Fi, etc. Abstract: This paper presents a compact microstrip antenna using FR-4 substrate for dual band circularly polarized operation using a modified square ring slot in the ground plane with microstrip line feed. Simulation of the impedance characteristic and radiation characteristic for the proposed antenna is carried out using commercially available HFSS software. The simulated data validate measured results and shows good agreement. Proposed antenna shows an impedance bandwidth (return loss >10 dB) of 50.88% at 5.9 GHz of center frequency and 29.92% at 12.8 GHz of center frequency for lower and upper band, respectively. The 3 dB axial ratio bandwidth for lower and upper band is 26.4 and 3.0%, respectively and measured peak gain for the lower and upper band is found as 3.2 and 3.4 dBic, respectively. The proposed antenna can be suitable for wireless communication in C and Ku bands. Abstract: In this article, the material distributive topology-based design optimization of ultra-wide band (UWB) antenna is proposed by using improved binary particle swarm optimization (BPSO) with finite difference time domain (FDTD) method. In the improved BPSO implementation, the velocity of each particle is calculated based on complete set of bits of particle position vector. The V-shaped transfer function is employed to transform all real values of velocities to values in the interval [0,1]. The fitness function of all the particles in BPSO algorithm are computed parallely by using FDTD simulation. The usage of FDTD and the parallel computation helps in analyzing the broadband frequency characteristics of the antenna with a single simulation run. The return loss of the optimized UWB antenna obtained from FDTD, Computer Simulation Technology (CST) simulation and practical measurement are in good agreement and show good impedance matching.